Despite big number of contending political parties the party programs are all nearly similar. However, they all are not equally close to today’s governing mechanisms, in other words, the accessibility of administrative power, allowing to manipulate the voting results if the electoral base is badly weak. The limited access to such mechanisms makes the deprived to do everything in the race for power: here and now. While the elites in Kyrgyzstan were busy with "revolutions", the life of common people was the same or deteriorating. So far we have observed neither radical change of elites nor real upgrade of local authorities. The elites declare the ideals of freedom and democracy while common people show moral degradation and total obduracy…"
… Pro-government, represented by the leaders that after anti-constitutional events of April 7 urgently prepared the myth, called Interim Government. The myth turned into 14-headed monster. Allegedly, since April 7 these mythological persons have become rich, injected money in the shadow accounts of political parties and serve as new "patrons" for businesses. These parties – Ak-Shumkar (Temir Sariev), Ata-Meken (Omurbek Tekebaev), SDPK (Almazbek Atambaev, Roza Otunbaeva), BEK (Azimbek Beknazarov) – will be the main beneficiaries of administrative mechanisms. …Revanchist, i.e. those, striving to reconsider their defeat in the past; today, obviously, they are driven by ex-president clans although there are no direct evidences. For instance, Ata-Jurt party is represented by former – tied with previous regimes – leaders, including high-ranking officials of Ak-Jol party. In other words, rich people lose the sources of income and control over big financial flows because of new mythologists from interim government. Most likely, such revanchist parties will do their best to restore the status quo. Such party members ignore the offers of current government "to reach consensus": if in the struggle for power they do not get seats in the parliament they will do their best to let anyone else, including pro-government leaders, go there. The communist party. Its leader Iskhak Masaliev has ties with both Bakiev’s and Akaev’s teams. However, due to the criminal case, filed by the interim government against him, he formally resigned from the position in the party. Depending on the situation, the interim government may offer him participate in the elections and gain 2-3 seats in the parliament, keeping the ground for further political career. If the pro-government parties do not gain enough votes in Jogorku Kenesh, Masaliev and Co may be needed to establish the coalition of parties. Sodruzhestvo (Commonwealth). The formal chairman is Vladimir Nifadiev, the provost of Kyrgyz-Russian Slavonic University. The second in the list is police general Omurbek Suvanaliev. The party list also includes Russian influence agents. Sodruzhestvo aims to become the civilized alternative at the parliamentary elections. Sodruzhestvo became the part of Ak-Jol in the past due in order to preserve few seats for ruling party. Two months ago Sodruzhestvo re-emerged as the independent party again, perhaps, under the influence of Russian fellow countrymen. Ar-Namys. The party leader general Felix Kulov has always been opposing the official governments. He was always trying to combine financial and political interests in patriotic course. He supports presidential, but not parliamentary rule, positioning himself as "powerful hand", able to restore the order. Butun Kyrgyzstan (Single Kyrgyzstan). The chairman is general Miroslav Niyazov, the former Secretary of the Security Council. He also positions himself as "powerful hand" although his ambitions are not backed up by actions. The second in the list is Adakhan Madumarov, the former teammate of Bakiev. Obviously, he must provide Niyazov with strong fingers (or fists) – the electorate. This is very dangerous mix as well as everything, related to today’s southern Kyrgyzstan. Respublika, headedby Omurbek Babanov – young, ambitious businessman and yesterday’s deputy Prime-Minister of Bakiev’s government. Such people have not only big money but also good ideas – for instance, how to protect personal wealth. In this case, he badly needs deputy’s immunity. … There are many parties, whose leaders try to protect their wealth. 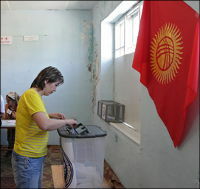 Rich revolutionary experience of Kyrgyzstan teaches wealthy people to generously sponsor the election services of the segment of electorate that views voting as criminal occupation. Under current shadow practice of pseudo-political and pseudo-economic system "the cleaning" of independent parties, protecting their property and rights, is inevitable. No wonder why in such mess there is no electorate behind any of the parties. Perhaps, this is the only common feature of the registered parties. How do the parties attract motivated members? Simply saying, every listed candidate donates money to the party and promises to attract certain number of electorate’s votes. Another vivid feature is that all parties are de facto criminalized since financial contributions are made both legally and illegally. Nearly all party structures establish youth wings in order to show the outrage of the civil dignity upon necessity. Hence, we have the following balance in Kyrgyzstan today: administrative power, hurriedly established by interim government and own, pocket, small parties. At the same time, the administrative power is significantly less influential in the regions. For instance in southern Kyrgyzstan with home of Bakiev’s clan, interethnic clashes the real power is controlled by criminals civil forms because this is the only way to establish power. On the other side of ballot box there are the rest people that want to promote their candidates in order secure themselves from non structured, totally corrupted and criminalized authorities. In this concern, in fact, the prediction of the upcoming parliamentary results in Kyrgyzstan does not make much sense because people do not really have a choice. There is substitution of choice through election games. There is substitution of parliamentary deputies, delegated by people to the supreme legislative authority in order to ensure rule of law, by the deputies game where the players want to gain personal immunity. There is substitution of inevitably just punishment by the game, where fair buy-out from official claims is also inevitable. There is substitution of civil society that could independently manage itself by the game of the players, adhered to "patron-client" system.